This course is suited for teenagers between the ages of 13 and 18 years old. Teenagers are exceptionally vulnerable to social and criminal attack due to the fact that they are generally very impressionable and naive to real world violence. A major threat for teenagers is their pre-occupation with technology. All too often personal safety takes a back seat due to checking social media, texts and e-mails. The teen demographic often make decisions based on group acceptance instead of what is really the best course of action for them. Teenagers mostly believe that they will be kept safe by technology/apps or the police. This leads them letting down their guard and makes them particularly vulnerable. 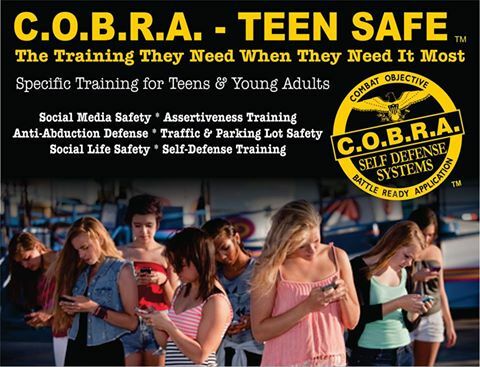 As with most demographics, teenagers have little to no personal safety/REAL self-defense training. To increase their vulnerability even more, teenagers are highly occupied by school, sports and extracurricular activities which makes self-defense training a low priority.